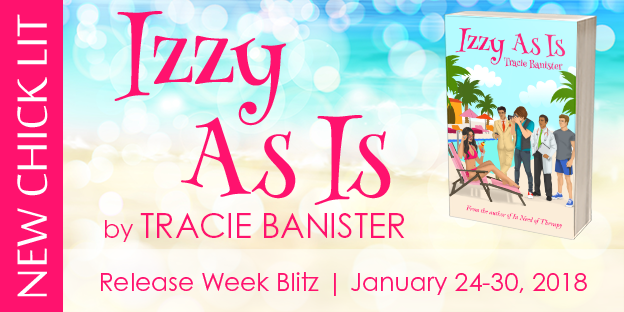 Purchase a copy of Izzy As Is during release week (January 24-30, 2018) and you could win a fantastic prize pack inspired by the book’s sassy Latina heroine (nail polish, jewelry, and mojitos are some of her favorite things) and the beachy setting in Miami. People who purchased Izzy during the pre-order period are also eligible for the giveaway! To enter this giveaway, e-mail Tracie Banister at traciebanister@gmail.com with your proof of purchase. Entries will be accepted until midnight on January 30, 2018 when a winner will be selected via random drawing. This is an international giveaway, so anyone who buys Izzy As Is within the allotted time frame is eligible to win. Good luck!